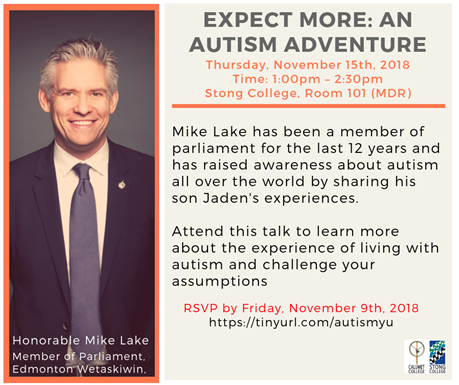 Learn about autism and challenge your assumptions of people living with autism by attending this talk where Mr. Lake will share his son Jaden’s personal story. His goal is to change the way we think about people around us - their abilities, their challenges and unique contributions. Mr. Lake has been a Member of Parliament for the last 12 years and has raised awareness about autism all over the world. This is an exceptional opportunity to learn about autism and the experiences of families living with autism.